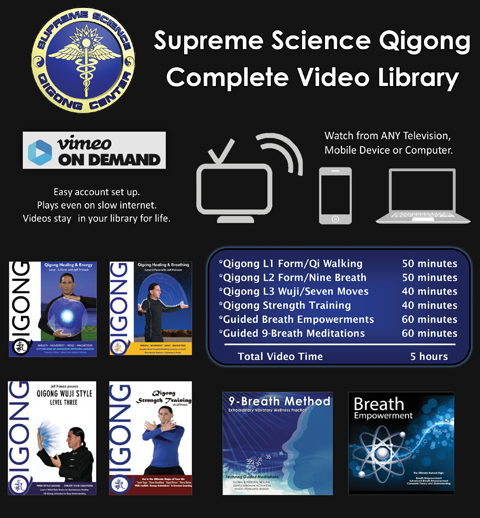 VIDEO package saves $125 off ordering separately and allows you to PLAY ALL our Qigong and Food Healing Videos for life. Payments for Videos are processed through Vimeo. Qigong Level-1 HD Video – 42 Min: Routine with realistic energy animation and custom music. Level-1 is our main practice and the video’s animation deepens experience of Qi. Qigong Level-2 HD Video – 34 Min: Routine with realistic energy animation and custom music. Bonus Jeff/Kai explain 9-Breath Method. Qigong Level-3 HD Video – 40 Min: Animated instruction in 7 Wuji movements. Learn to step and balance like a Tai Chi expert. Qigong Strength Training Video – 43 Min: Intense routine with warm up, Tao stretching, body-weight exercises and more. Guided Breath Empowerment Series – Two 30 Min practices.